1. 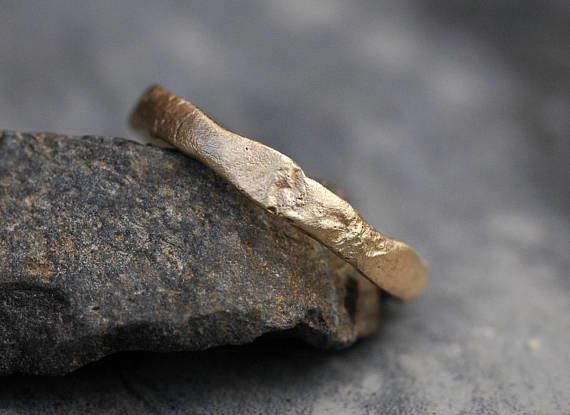 A recycled gold ring made to order that'll have your "something old" covered in the most stunning way. Get it from Specimental on Etsy for $650 (available in sizes 0–16). 2. 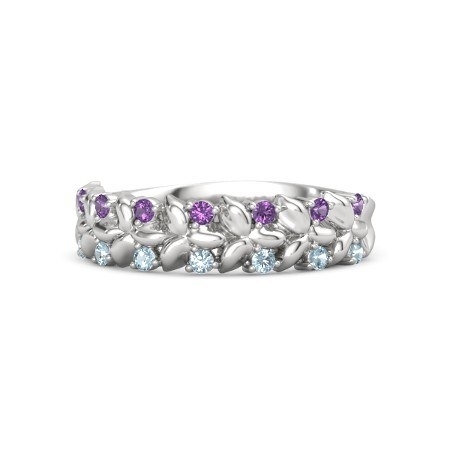 A customizable band with the option to select from 20 gemstones (including diamonds) and nine finishes — for a ring that's just as unique as your relationship is. Get it from Gemvara for $295–$1,195 (available in sizes 4–10 and in nine finishes). 3. 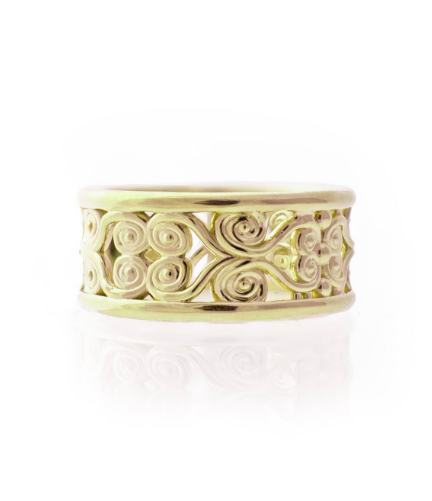 A classy gold ring that puts a subtle twist on the traditional wedding band. 4. 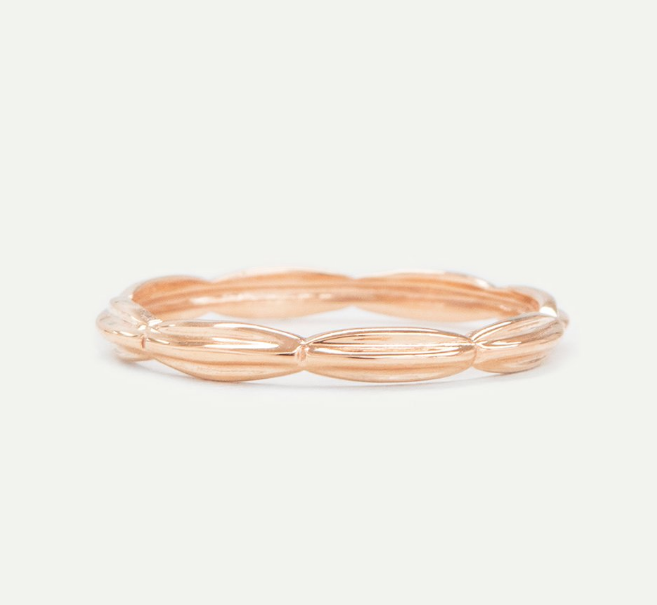 A chic, minimalist band for the couple who loves getting ~wavy~ together. Get it from Gemvara for $150–$695 (available in sizes 4–10 and in nine finishes). 5. A custom fingerprint ring featuring a quirky inner detail, for a classic-looking ring with a discreet, truly one-of-a-kind engraving. Get it from GNGJewel on Etsy for $209 (available in sizes 4–11/ 3/4). 6. An unforgettable 18k rose-gold band with orange sapphires that's ready to turn heads from now until forever. Get it from Neiman Marcus for $2,340 (available in size 7). 7. A rustic style with a cross-hatch design perfect for outdoorsy types who don't want to worry about scratching up their wedding band — or anyone who just likes a cool-looking ring, really. Get it from tinahdee on Etsy for $66 (available in sizes 3–16). 8. 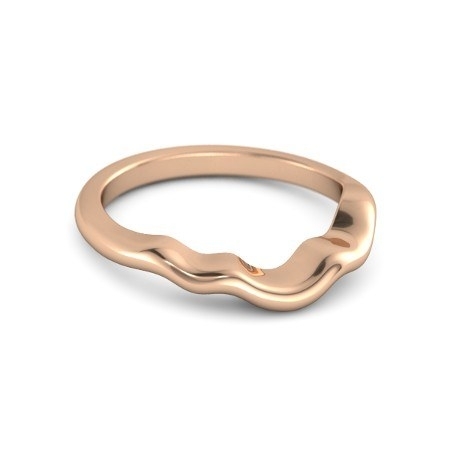 An 18k-gold vertical-bar ring that successfully manages to be elegant AF and make a playful statement all at once, because you contain multitudes. Get it from Neiman Marcus for $1,600. 9. 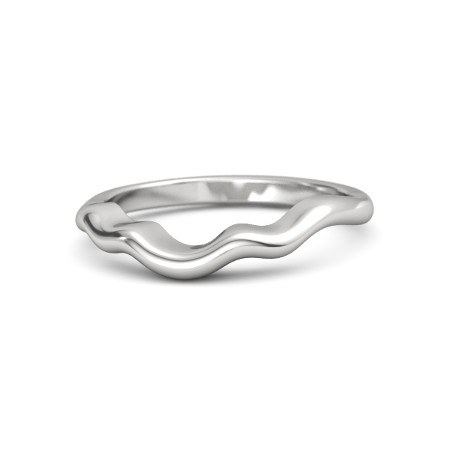 A sterling silver piano-designed band with true-to-life proportions, for the person who has the keys to your heart. Get it from GioielliOliveri on Etsy for $113.12 (available in 1.65–2.05 cm diameters). 10. A blackened-silver band with white sapphire and 18k-gold accents for a ring that boldly proclaims, "I'm not your grandma's ring, buddy." Get it from Nordstrom for $790 (available in sizes 5–9). 11. A set of titanium rings adorned with vibrant color, because you're the furthest thing from a boring couple and your wedding bands know it. Get the set of two from RomasBanaitis on Etsy for $180 (available in custom sizes). 12. 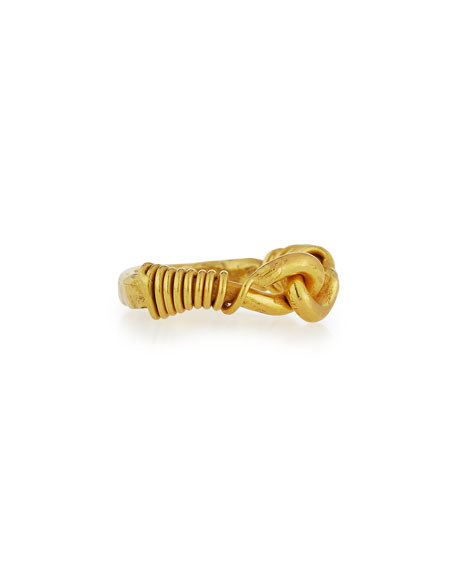 A "rice bead" ring with a charming minimalist carved design, for the understated nontraditionalist. Get it from A Gilded Leaf for $190 (available in sizes 4–8 3/4, in white gold, rose gold, and yellow gold, and in a shiny or matte finish). 13. A handsome oxidized sterling-silver ring with a black-gray finish that will wear over time to become a smoky silver color. Cool! Get it from Epheriell on Etsy for $95 (sizing made to order). 14. 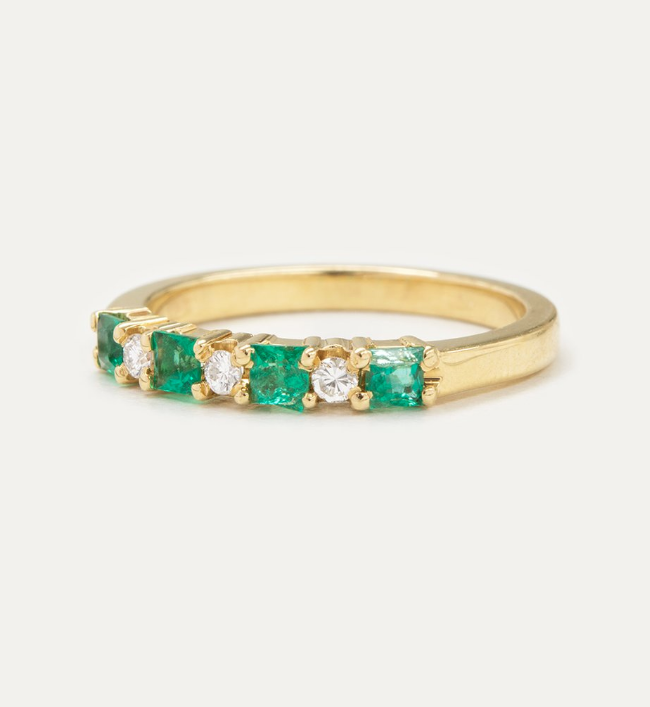 A gorgeous 18k yellow-gold band studded with diamonds and either rubies or emeralds, because life is short — why not add a little pop of color to your forever ring? 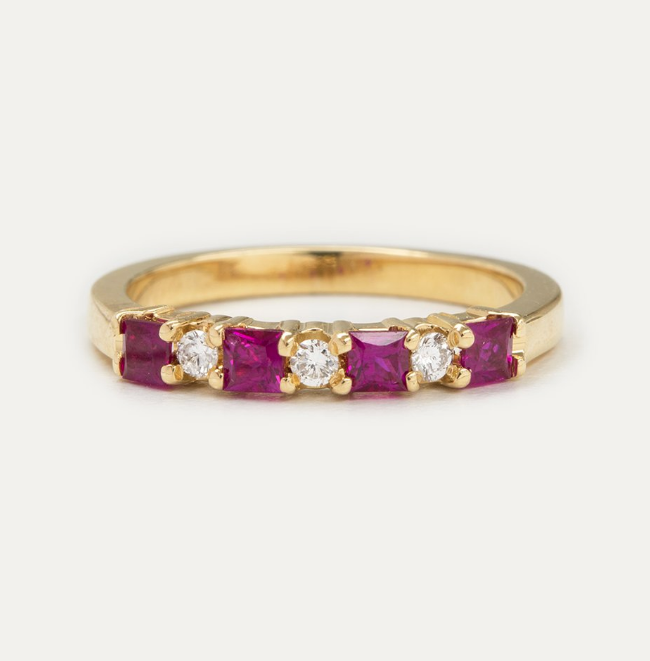 Get the ruby band for $575 (available in sizes 5 1/2–7 1/2) and the emerald band for $500 (available in sizes 5 1/2–7 1/2) from A Gilded Leaf. 15. 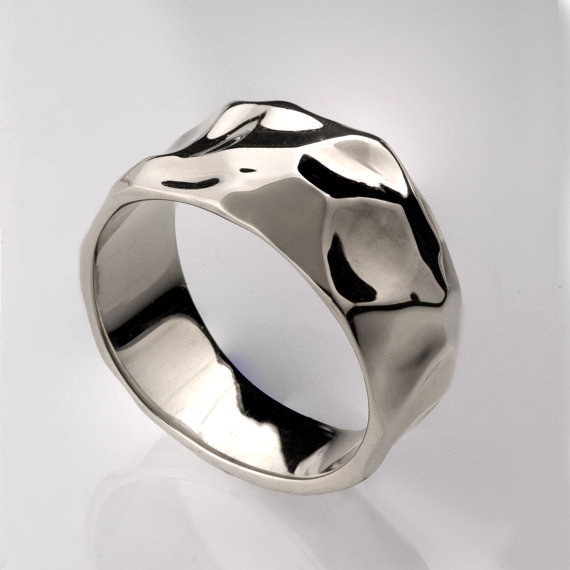 A set of leopard-print-esque wedding bands for the couple whose love shall never be tamed. Get the set of two from DesignMasters on Etsy for $1,599 (available in sizes 4.5–11.5). 16. 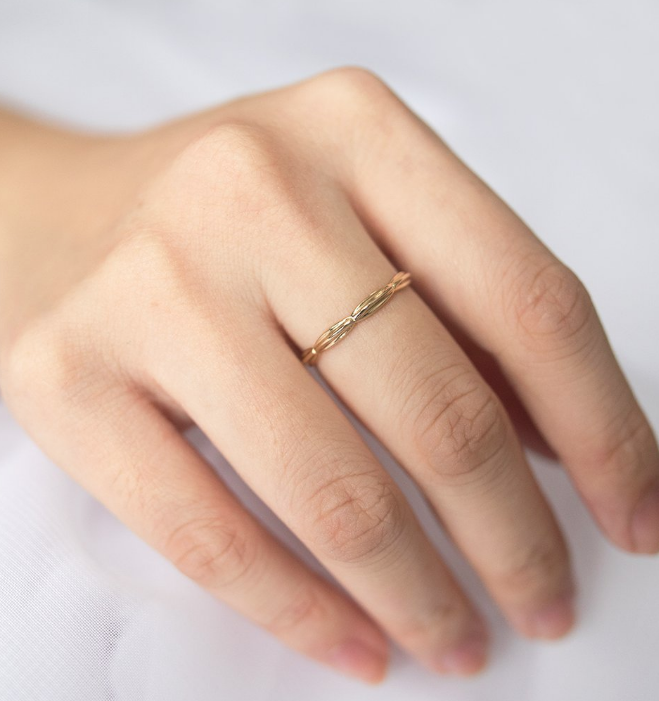 This sharp-looking ring with quaint detailing that lends it a bit of an industrial vibe, for anyone looking for a beautiful band that's just a lil' out of the box. Get it from Nordstrom for $115–$120 (available in sizes 5–8 and in gold and sterling silver). 17. This dazzling little number speckled with diamonds and tiny flowers to represent a love that'll forever be ~in bloom~. Get it from Kataoka for $1,750+ (available in sizes 3–11 and in four finishes, with the option for free custom engraving). 18. 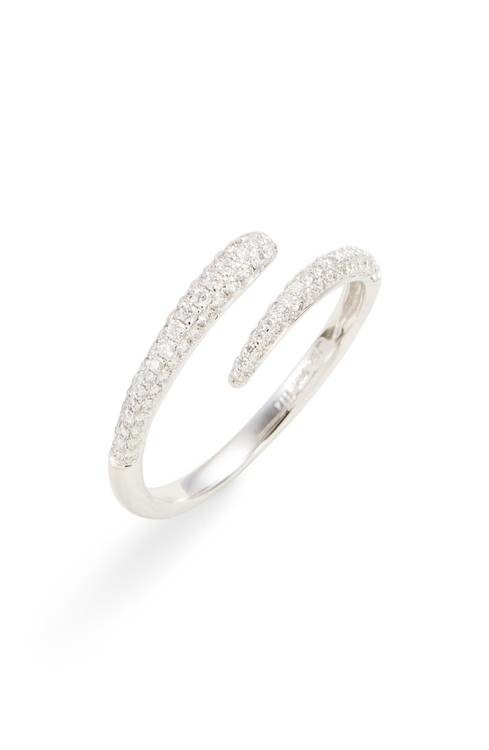 A delicate curved diamond band that'll look amazing on its own or stacked above an engagement ring. 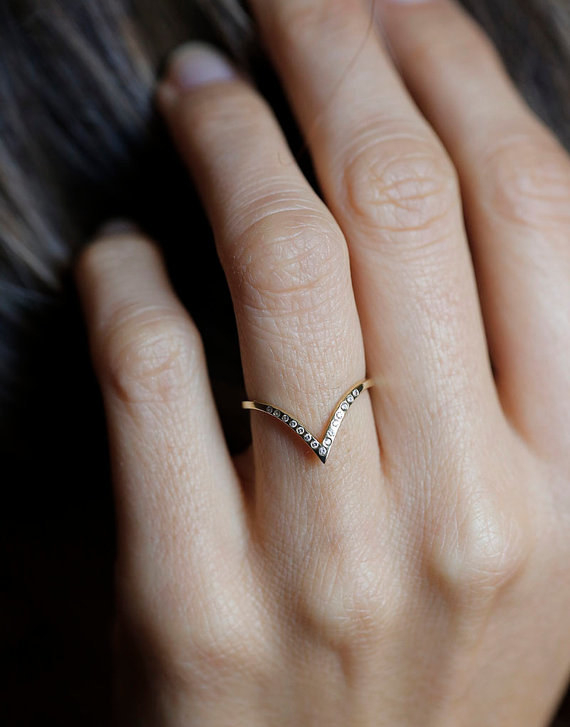 Get it from A Gilded Leaf for $415 (available in sizes 4–8 3/4 and in white gold, rose gold, and yellow gold). 19. A hammered black-zirconium and rose-gold band for a style that has "debonair" written all over it. Get it from Spexton on Etsy for $489+ (available in sizes 3–12 and in five widths). 20. A glittering crisscross ring that'll have you singing "Hold me closer, tiny diiiiamonds" (it's got 24 of em!). Get it from Nordstrom for $350–$395 (available in sizes 4.5–7.5 and in rose gold, yellow gold, and silver). 21. A double-banded ring, because you know you're a little extra, and your wedding band should be too. Get it from Jennifer Zeuner Jewelry on Spring for $520 (available in sizes 6 and 7). 22. 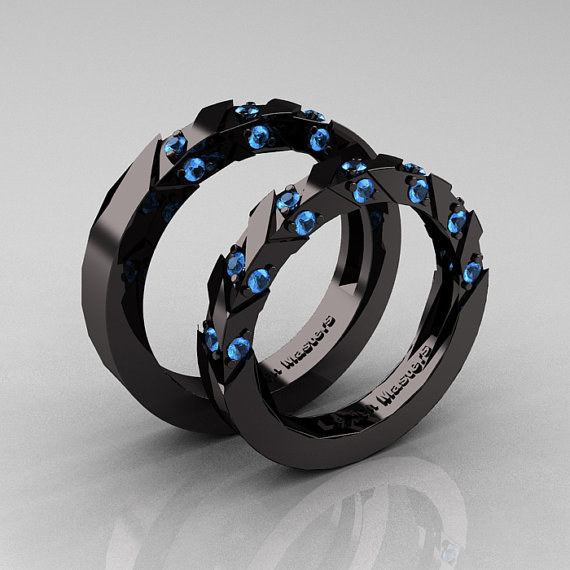 This goth-y glam 14k black-gold and pink sapphire or blue topaz wedding-band set of your dreams. Diamonds who? Get the set from DesignMasters on Etsy for $2,199.99 (available in sizes 4.5–9). 23. A showstopping 18k yellow-, white-, and pink-gold ring with white ceramic that'll demand everyone's attention even long after your wedding day. Get it from Neiman Marcus for $3,390 (available in European size 53). 24. A vintage-y lace-detail ring you can customize with two different gemstones (including diamonds) of your choice. Choose from 20 different gemstones. Get it from Gemvara for $415–$1,810 (available in sizes 4–10 and in nine finishes). 25. 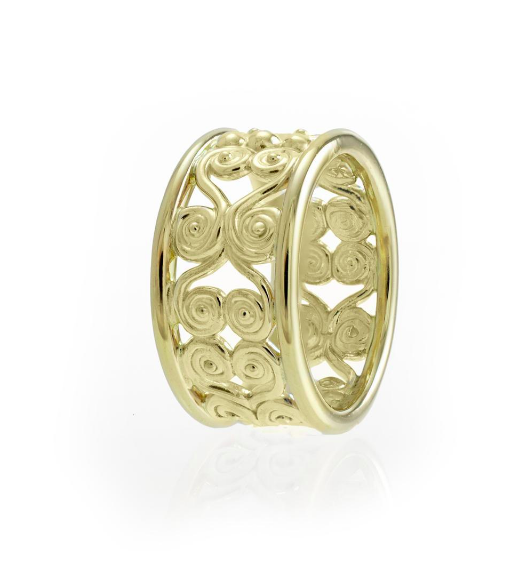 A 14k-gold curved V-shaped band whose picture is probably featured in the dictionary's entry for "elegance." 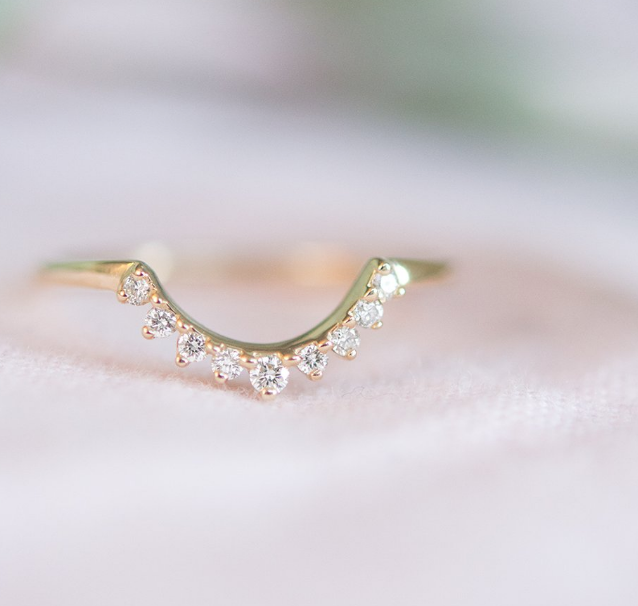 Get it from Minimal VS on Etsy for $440–$645 (available in sizes 2–8, in five finishes, and with either diamonds or zirconia). 26. 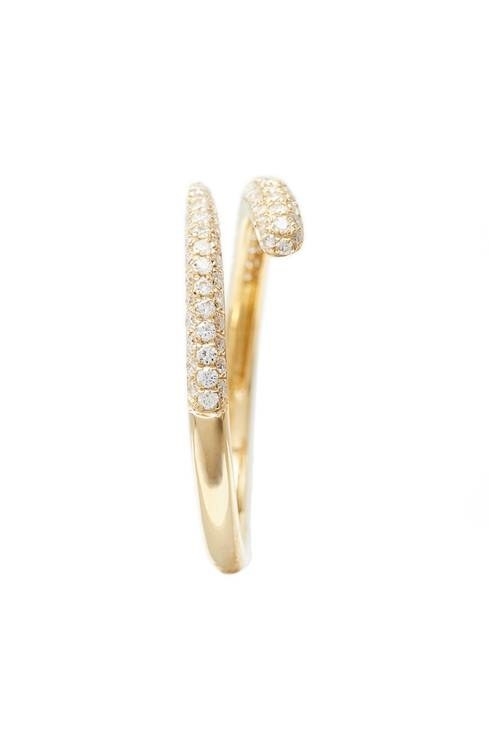 A 14k-gold textured band with an unexpected, asymmetrical shape and just enough bling (nine diamonds, to be exact). 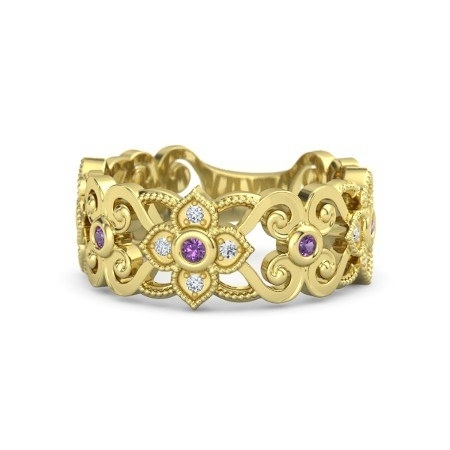 Get it from Vanessa Lianne Jewelry on Spring for $825 (available in sizes 5–7.5 and in white gold, rose gold, and yellow gold). 27. An adorable blades-of-grass ring for the couple who appreciate a touch of whimsy — and the great outdoors. Get it from Ashhilton on Etsy for $215–$1,890 (available in sizes 3–13 and in seven finishes). 28. An ornate 14k green-gold filigree band with a timeless, striking design. Get it from J. Briggs & Co. on Shoptiques for $1,365 (available in size 7.25). 29. 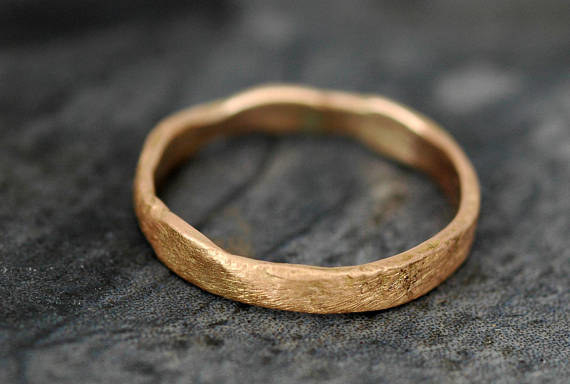 A hammered 14k-gold ring whose curves will reflect the light in all sorts of interesting patterns. 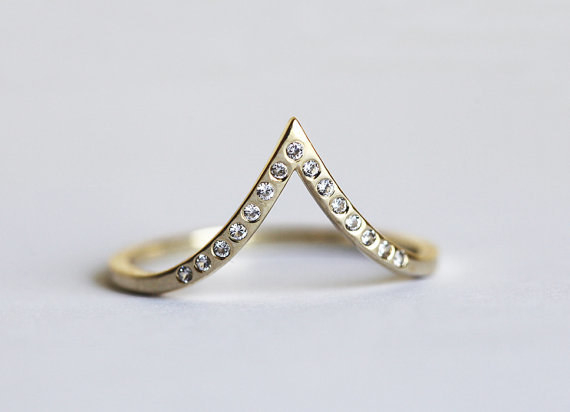 Get it from doronmerav on Etsy for $570 (sizing made to order and available in white gold, rose gold, and yellow gold). 30. 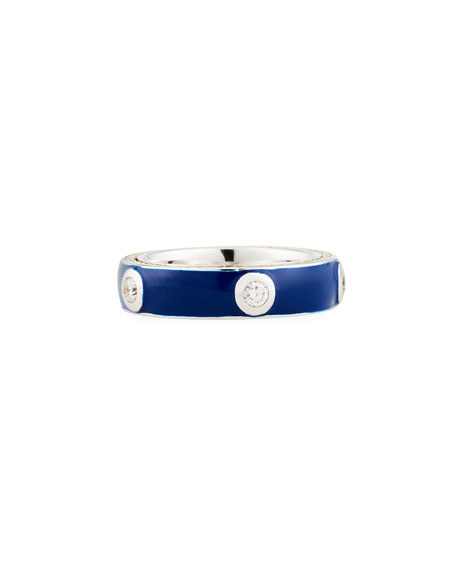 A complementary set of white and blue bands for the couple who doesn't play by any of your silly rules. 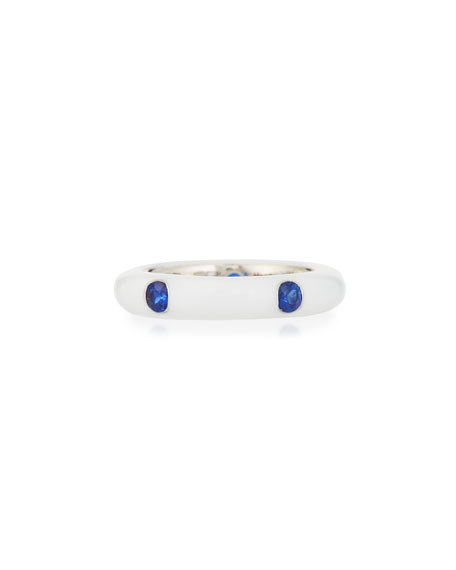 Get the white enamel ring with blue sapphires for $2,340 (available in size 6.75) and the blue enamel ring with white diamonds for $6,780 (available in size 6.75) from Neiman Marcus. 31. A customized latitude-longitude sterling-silver ring that you can have stamped with the coordinates of a place that's special to you. Get it from monkeysalwayslook on Etsy for $82 (available in sizes 0–14). 32. This dazzling ring with 100 micro-pavé diamonds and an open design, for a charming take on the traditional diamond wedding band. 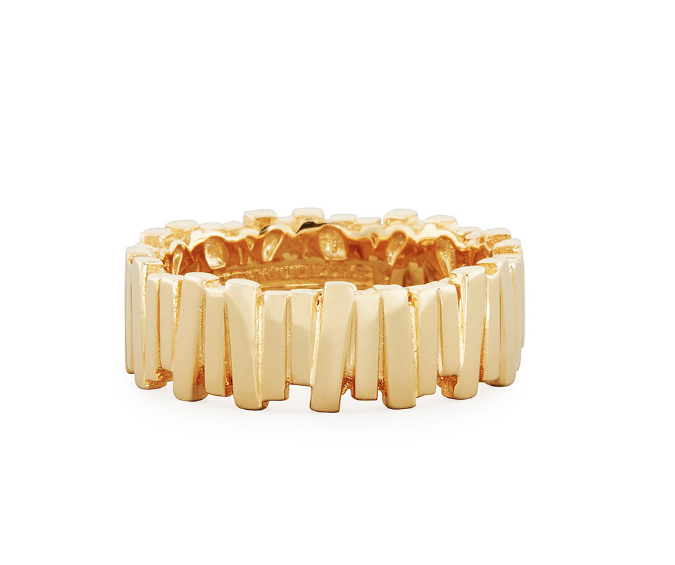 Get it from Nordstrom for $1,695 (available in size 6 1/2 and in yellow gold and white gold). 33. 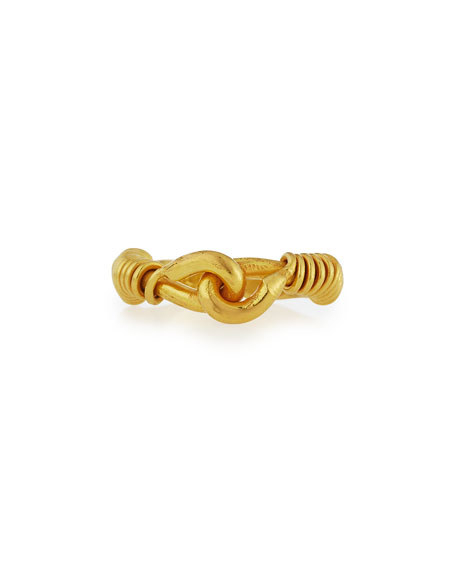 A 22k-gold interlocking ring with a coiled design — because your hearts are intertwined forever and you're a sappy, sensitive soul who also just really loves wearing 22-karat gold, okay? Get it from Neiman Marcus for $3,600. 34. A set of beautiful, simply designed 18k-gold branch-detail bands for the nature-loving couple (or, perhaps, aspiring the arborists). Get it from PatricioMinconiBCN on Etsy for $1,253.34 (sizing made to order, and available in white gold, yellow gold, and rose gold). 35. A dapper forged-carbon David Yurman band that's about to steal the whole damn show, so get ready for it. Get it from Nordstrom for $1,300 (available in size 10). 36. And personalized sound-wave rings that visually capture the unique sounds of your voice and celebrate the depths of your sweet, sweet geeky love. Get the set from Rickson Jewellery on Etsy for $425 (sizing made to order).